^ a b Brandon Stosuy, "Heavy Metal: It's Alive and Flourishing", Slate, August 19, 2005. Access date: August 22, 2008. ^ William York, Allmusic, Sunn O))) Biography. Access date: August 23, 2008. ^ a b c d e f g h i j k l m n John Wray, "Heady Metal", New York Times, May 28, 2006. Access date: August 18, 2008. ^ a b c d Jan Tumlir, "Primal dirge", Artforum, April 2006. Access date: August 22, 2008. ^ Jon Caramanica, "The Alchemy of Art World Heavy Metal". International Herald Tribune, September 20, 2005. Access date: August 25, 2008. ^ a b c Steve Smith, "Where Classic Avant-Garde Gets a Hint of Heavy Metal", New York Times, September 13, 2006. Access date: August 28, 2008. ^ Jason Jackowiak, Splendid, September 14, 2005. “アーカイブされたコピー”. 2008年9月27日時点のオリジナルよりアーカイブ。2008年9月15日閲覧。 Access date: August 23, 2008. 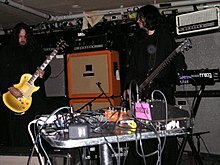 ^ Oliver Spall, "Sunn O))) and Boris present Altar", Flavorpill, December 10, 2007. “アーカイブされたコピー”. 2008年12月8日時点のオリジナルよりアーカイブ。2008年8月22日閲覧。 Access date: August 22, 2008. ^ Ample Fire Within review, "Soundcheck", The Wire, July 2008, p. 45. ^ Kim Kelly, "Choice Cuts", Terrorizer #189, October 2009, p. 22. ^ Joe Panzner, Sheer Hellish Miasma review, Stylus, September 1, 2003. “アーカイブされたコピー”. 2008年8月28日時点のオリジナルよりアーカイブ。2008年8月23日閲覧。 Access date: August 23, 2008. ^ Pitchfork news, March 11, 2009. Access date: March 21, 2009. ^ Jim Jarmusch and Alan Licht, "Invisible Jukebox", The Wire 309, November 2009, p. 23.